Because God is LOVE– there must be an other to be loved. Love makes no sense if it is not expressed. This explains the centrality of the doctrine of the Trinity. 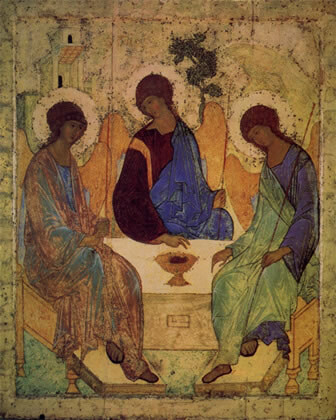 God is Trinity – Father, Son, and Holy Spirit, forever enjoying a dance of love and passion. The Father and Son are WITH one another in relational love. The Holy Spirit is in the middle of that love – celebrating and being a part of the relationship. This relational Trinitarian life expresses the rational for God creating. Love creates. Love gives birth. God created the world and all that is in it – including humankind – for the purpose of sharing the Trinitarian life and love of inclusion, acceptance, and adoption. Jesus, the Son, loves the Father (whom he calls “abba” or “Papa”) and has as His central passion to glorify His Papa by revealing His true nature as a God of loving grace, inclusion, and acceptace. The Holy Spirit excels at celebrating relationship. The Spirit loves the Father and the Son – and magnifies the relationship that exist between them. The Spirit’s work among humanity is to enhance our awareness of God’s relational love, so that we will realize (come to an awareness) the fact that we have been caught up in Christ into the relational love of the Triune God. Coming to the awareness of God’d love is coming to faith. It is realizing that we were created to be included in the divine dance of love (theologians call this perichoresis). This amazing good news of grace reveals that God is not a legalist, concern with the rules, rituals, regulation, and requirements of some stale religious tradition. God is not the head of an institutional religious institution, concerned only with its self-preservation. God is different than that! God is a compassionate Papa; a caring brother; and and indwelling Spirit – whose primary passion is that we all may know and personally experience His acceptance, inclusion, and adoption of us all by grace. This is salvation: The human Son of God came to give humanity rebirth by taking away the sin of the world (John 1); by including/adopting us from before creation and the fall (Eph 1); and by giving life to all (Roman 5); SO THAT we might have faith and thereby experience the new birth. We are redeemed apart from any action on our part. This redemption is so that we might have faith, experience salvation, and enjoy life in Christ as a part of the Trinitarian dance. You are invited today to participate in the life and joy of the dance. 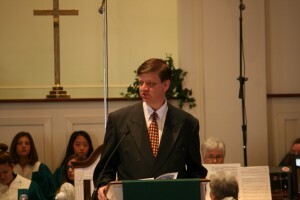 My name is Bill Nieporte, for thirty plus years, I have been a pastor, preacher, speaker, and teacher. I manage this site and its contains personal thoughts, sermons, essays, book reviews, and more. The central aim of this blog is to share the good news of the Triune God of grace. In addition to my own materials, you will also find links, videos, and materials written by friends who share similar thoughts and theology. I say “similar” because I do not necessary agree with everything posted on or linked in this site. What I share is stuff I find interesting, inspiring, educational, and/or challenging. If you disagree with any of it – of with anything I have personally written – that’s your right. Heck, I may not fully agree with anything I shared last week, last month, or last year. I am a work in progress. So, let me say that I love to RESPECTFULLY engage in discussion and exchange. Feel free to join my Facebook Community. It was a pleasure to meet you this morning. This is going to very interesting. I can not wait to read your blog. Have a great day and continued prayers for our ministry. Thanks Irene – I am honored you are reading my blog. I really enjoyed your article about ministers and funerals. Too often we hold in our own grief at the loss of a church member friend, only to have it come out at a time when we least expect it. I conducted my father’s funeral, holding off my own grieving, and then, several years later, fell apart at the funeral of a man who had become father-figure for me. I learned about your church about a yr. ago when a son moved to Richmond for employment. As far as I know, he never did seek you out but I’ve enjoyed looking at the site and listening to your sermons. I’ve been a United Methodist for the majority of my life but have been visiting a community church (baptist oriented), while visiting with grandchildren. I am a MA native but have extended family in Deltona FL, greater Richmond and state of VA areas as well as Atlanta. Most of my own children and grandchildren live nearby. Now my son is searching the country as an actuary due to the downturn of Genworth Financial. He is the only single child and will always have a mother’s prayers. Best wishes to you as you continue to do the Lord’s work. Want to thank you for filling in some of the blanks on Burleigh Tatum. When I was a kid growing up in Franktown, so many summer days I saw a man and his shepherd (dog) pass by and wave. That was a common thing back home, but his wave was genuine and, well, you got to like a man who lets his dog ride in the front seat. Years later I asked who that man might be and heard it was Burleigh Tatum. Funny the things you remember about a regular passerby to whom you never had spoken but his wave always seemed so warm. Your funeral talk about him helped much of it make sense. To me he was a reminder that the little kindnesses matter. Thanks.